The questions were a combination of basic, naive and cute. But as an underprivileged group of 8th grade students in Durham, North Carolina watched country profile videos and interacted with Duke Cross Continent MBA students from India, Spain, Qatar and China, it was clear that many of the young kids’ interest was peaked about the world. The volunteer project held this past Wednesday also provided learning for the international MBA students as it gave them a perspective of middle school aged children in the United States. One week ago, I attended another Duke University event that demonstrated powerful global learning with a local slant. The Arabiyat event brought together individuals interested in learning about music, culture and food from different Arab countries. The event also kicked off the Dardasha Project, a Duke community service initiative that allows advanced Arabic studies students to teach and learn from Iraqi refugees living in Durham. Just yesterday my family and I participated in the Raleigh International Festival. Different foods and cooking courses from around the world were available. 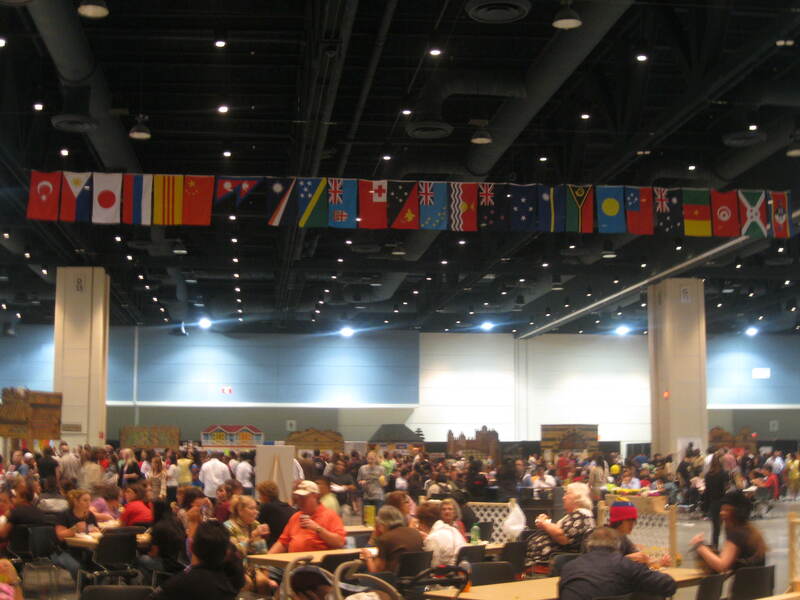 Many individuals represented their home countries in presenting their histories and customs in display booths on the exhibition floor. There were dance shows and sessions for children. I was delighted to see the event so well attended in Raleigh’s large, state of the art convention center. Individuals of all ages and backgrounds seemed to be enjoying the experience. In my estimation, a global education is no longer a nice add-on, but rather a necessity. In our interconnected world, events in one part of the globe cause ripple effects across the planet. Future friends, enemies, competition and customers from all corners of the earth are literally at our fingertips. I would argue that greater knowledge of the world would help the United States address its unemployment problems. The same probably holds true for many other countries facing a similar challenge. I also believe that continual education of the world doesn’t only apply to students and teachers taking part in a formal school environment, but also professionals. – Current events with a global focus. For teachers, spend considerable time on current events, and make sure to bring in voices from outside the country. For example, when looking at a national political issue, point out how other countries are handling the same topic. For professionals, we all want to be experts in our own little niches. Fair enough, but this needs to be balanced with having a global perspective. So find out about what’s happening in other parts of the world by checking out online newspapers, watching newscasts from different countries and following live streaming events of international conferences and forums. – Foreign films. Professionals and students alike can gain new perspectives on the world by watching foreign films. – International events. As illustrated above, there are numerous ways to connect with cultural events within our cities and universities that have the potential to open our minds to new perspectives. Our museums and galleries have a number of ways to connect us with different cultures. So do our restaurants (and for Americans, this does not include the International House of Pancakes!). – Exchanges. There are different ways this can play out. For example, schools can use virtual classroom resource technologies to connect with students from afar. Families can host international students. Professionals can use social media outlets such as LinkedIn in to expand their networks and learning opportunities. Surely there are other creative ways to make this happen as well. – Getting to know our neighbors. In many places, the world comes to our communities: universities yield international students, business men and women from afar transfer for jobs, refugees escape their native lands in hopes of a brighter future, and immigrants share our city and town resources. All too often, we don’t think to acquaint ourselves to the foreigners among us. And if we do, we often times rather talk and be heard as opposed to listen and gain new perspectives. – Social media. The top three individuals with the most Twitter followers are Lady Gaga, Justin Bieber and Katy Perry. Imagine how much more informed our world would be if the top Twitter accounts were the Council on Foreign Relations, The Economist and the International Monetary Fund. I won’t hold my breath that this would ever happen. However, it is worth noting that while social media can serve as a means to us wasting our time in celebrity gossip, it also has the potential to provide great learning about the world. – Read, read, read. In our instant information society, we like quick and snappy information. As noted above, let’s use social media effectively for learning about the world and connecting to others. At the same time, let’s not forget about the power of a good old-fashioned book that would provide a new perspective on the world. – Language learning. Anyone can learn a foreign language. For Anglophones, the mindset that English is the de facto global language so let the world communicate in my native tongue is quite shallow. While language learning is certainly accelerated by living in another country, we can also do this in our own backyards and living rooms easily and economically. Books, tapes, online resources and interacting with our international neighbors are just a few ways to make this happen. When watching films, put on subtitles. Study signs which have dual language notifications. There are numerous little things we can incorporate into our everyday lives to make language learning possible – and fun! – Volunteer. Almost all of our communities offer outlets to volunteer and in many cases this type of service can have global impact. – Houses of worship. While the motivation for going to church, synagogue, the mosque, etc shouldn’t be to learn about the world alone, the reality is that many houses of worship provide the opportunity to connect with different countries. As a practicing Christian, many of the churches that I have attended have sponsored international mission trips for congregants, supported missionaries around the world, and funded disaster relief during global catastrophes such as earthquakes in Japan and Haiti, among other humanitarian causes.